As the town looks to build density, a major hurdle lurks beneath the surface. In Oak Bluffs, wastewater issues are bubbling to the surface, even as town officials grapple with zoning bylaws that are stifling the creation of workforce housing in downtown Oak Bluffs: in particular, restrictions on the number of “top of the shop” apartments that can be added by the owners of two major buildings on Circuit Avenue who are undertaking major renovation projects. In recent weeks, the owners of the Phillips Hardware building, which is slated for a major expansion, and the owners of the the Lampost, which will undergo renovations, have embarked on the regulatory process before the Martha’s Vineyard Commission. In each case, the proposed outcome includes more apartments. 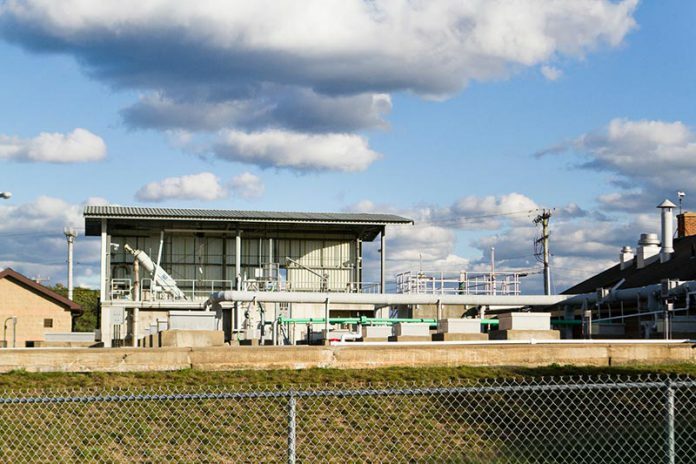 But as town officials and affordable housing advocates look to “build density where density exists,” wastewater will loom large, and tying into the town sewer system will not be an option without expanding the capacity of the current treatment plant. The good news for the owners is that sewering does not appear to be another regulatory river to cross. Phillips Hardware was approved for 12 bedrooms by the Oak Bluffs wastewater commission. Lampost co-owner Adam Cummings said he does not anticipate wastewater issues, since he is shuttering the nightclub and lounge, with a combined capacity of 425 people, which in his view should more than compensate for the 24 proposed bedrooms. However, new projects may expect to run into limited capacity. The current plant is about at its limit, wastewater officials said. Wastewater facilities manager Jim Monteith said that the plant is not technically at capacity at present, but it is when allocating for customers who have paid for betterments — access to town sewer — but have not yet converted from septic tanks. Mr. von Steiger said he is not optimistic that plant capacity will be increased any time soon. Ms. Barmakian said the town needs a comprehensive waste-management plan (CWMP) that projects wastewater needs 20 years into the future. “And that’s tied into the health of the ponds, which is declining rapidly,” she said. Nitrogen loading from wastewater leaching from septic tanks and cesspools is the main culprit in the ill health of Lagoon Pond, Farm Pond, and Sengekontacket Pond, according to studies. Title 5 septic system regulations were originally passed in Massachusetts in 1995 and last updated in 2014. However, Title 5 septic systems remove bacteria but do not remove nitrogen. “The good news is we have the effluent capacity, so we’re golden with that,” Ms. Barmakian said. Effluent is the water discharged after wastewater has been treated at the wastewater plant. The effluent beds currently in use are underneath Ocean Park. There are new beds, adjacent to the wastewater treatment plant on Pennsylvania Avenue, which will be used when expansion warrants it. 320,000 gallons per day. But the town forfeits roughly 20 percent of capacity to regional concerns — about 15 percent is consumed by the Martha’s Vineyard Hospital, and 5 percent is used by the Martha’s Vineyard Regional High School and the YMCA. The average house produces between 60,000 and 65,000 gallons of wastewater each year, or about 170 gallons per day. Currently, according to the Martha’s Vineyard Commission website, wastewater from about 1,800 properties is treated in one of the Island’s five wastewater treatment plants (Edgartown, Oak Bluffs, Tisbury, Martha’s Vineyard Airport, and Wampanoag Tribal Housing), while over 14,000 Vineyard properties (more than 90 percent) treat wastewater on site — in cesspools, in older septic systems, or in newer Title 5 septic systems. The next steps in expanding Oak Bluffs wastewater capacity are the creation of a CWMP and a plant optimization design, which will cost $350,000 and $400,000 respectively. Ms. Barmakian said both items will go before the town capital program committee and then be put on the town meeting warrant for a vote in April 2017. Although Oak Bluffs loses 20 percent capacity off the top for regional entities, thus far there have been no discussions with other towns about helping to pay for the studies, Ms. Barmakian said. Town sewer expansion is a hot topic on the Cape and Islands. Last week at town meeting, Nantucket voters overwhelmingly approved an $80 million extension of the municipal sewer system to more than 800 properties. This Monday, Orleans voters approved a $3.2 million wastewater article to fund a downtown sewer plan and to investigate innovative treatment methods, such as aquaculture.